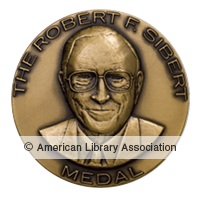 It’s awards season in library land. I look forward to this day each year, as I love predicting which titles will win which awards. 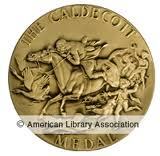 The ALA Youth Media Awards recognize distinguished “books, videos, and other outstanding materials for children and teens.” You may be familiar with the John Newbery Medal and Randolph Caldecott Medal, since we just finished our Mock Award voting for these two medals. (See our winners here). Recently award recognition has expanded to include awards that “highlight high-quality literature for young people about diverse peoples and triumphs of the human spirit.” Check out the honor and medal winners below and if you want to know more about the awards, follow the link to the ALA Youth Media Awards. 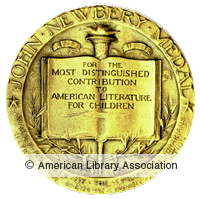 “Merci Suárez Changes Gears,” written by Meg Medina, is the 2019 Newbery Medal winner. The book is published by Candlewick Press. Newbery Honor Books: “The Night Diary,” written by Veera Hiranandani and published by Dial Books for Young Readers, Penguin Young Readers Group, an imprint of Penguin Random House LLC; and “The Book of Boy,” written by Catherine Gilbert Murdock, illustrated by Ian Schoenherr and published by Greenwillow Books, an imprint of HarperCollins Publishers. “Hello Lighthouse,” illustrated and written by Sophie Blackall is the 2019 Caldecott Medal winner. The book was published by Little, Brown and Company, a division of Hachette Book Group, Inc.
Caldecott Honor Books: “Alma and How She Got Her Name,” illustrated and written by Juana Martinez-Neal and published by Candlewick Press; “A Big Mooncake for Little Star,” illustrated and written by Grace Lin and published by Little, Brown and Company, a division of Hachette Book Group, Inc.; “The Rough Patch,” illustrated and written by Brian Lies and published by Greenwillow Books, an imprint of HarperCollins Publishers; and “Thank You, Omu!” illustrated and written by Oge Mora and published by Little, Brown and Company, a division of Hachette Book Group, Inc.
“A Few Red Drops: The Chicago Race Riot of 1919,” written by Claire Hartfield, is the King Author Book winner. The book is published by Clarion Books, an imprint of Houghton Mifflin Harcourt. King Author Honor Books: “Finding Langston,” written by Lesa Cline-Ransome and published by Holiday House; “The Parker Inheritance,” written by Varian Johnson and published by Arthur A. Levine Books, an imprint of Scholastic Inc.; and “The Season of Styx Malone,” written by Kekla Magoon and published by Wendy Lamb Books, an imprint of Random House Children’s Books, a division of Penguin Random House LLC. “The Stuff of Stars,” illustrated by Ekua Holmes, is the King Illustrator Book winner. The book is written by Marion Dane Bauer and published by Candlewick Press. King Illustrator Honor Books: “Hidden Figures,” illustrated by Laura Freeman, written by Margot Lee Shetterly and published by HarperCollins Children’s Books, a division of HarperCollins Publishers; “Let the Children March,” illustrated by Frank Morrison, written by Monica Clark-Robinson and published by Houghton Mifflin Harcourt Publishing Company; and “Memphis, Martin, and the Mountaintop,” illustrated by R. Gregory Christie, written by Alice Faye Duncan and published by Calkins Creek, an imprint of Highlights. “Monday’s Not Coming,” written by Tiffany D. Jackson, is the Steptoe author award winner. The book is published by Katherine Tegen Books, an imprint of HarperCollins Publishers. “Thank You, Omu!,” illustrated and written by Oge Mora and published by Little, Brown Young Readers. 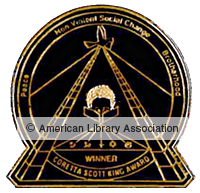 Dr. Pauletta Brown Bracy is the winner of the Coretta Scott King – Virginia Hamilton Award for Lifetime Achievement. The award pays tribute to the quality and magnitude of beloved children’s author Virginia Hamilton. 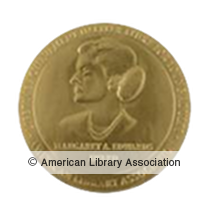 “The Poet X,” written by Elizabeth Acevedo, is the 2019 Printz Award winner. The book is published by HarperTeen, an imprint of HarperCollins Publishers. Three Printz Honor Books also were named: “Damsel,” written by Elana K. Arnold and published by Balzer+Bray, an imprint of HarperCollins Publishers; “A Heart in a Body in the World,” written by Deb Caletti and published by Simon Pulse, an imprint of Simon & Schuster Children’s Publishing; and “I, Claudia,” written by Mary McCoy and published by Carolrhoda Lab®, an imprint of Carolrhoda Books®, a division of Lerner Publishing Group. 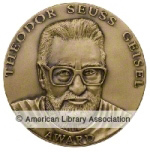 “Rescue & Jessica A Life-Changing Friendship,” written by Jessica Kensky and Patrick Downes, illustrated by Scott Magoon and published by Candlewick Press, wins the award for young children (ages 0 to 10). Honor book for young children: “The Remember Balloons,” written by Jessie Oliveros, illustrated by Dana Wulfekotte and published by Simon & Schuster Books for Young Children. “The Truth as Told by Mason Buttle,” written by Leslie Connor and published by Katherine Tegen Books, an imprint of HarperCollins Publishers, is the winner for middle grades (ages 11-13). “The Collectors,” written by Jacqueline West and published by Greenwillow Books, an imprint of HarperCollins Publishers. “Anger Is a Gift,” written by Mark Oshiro and published by A Tor Teen Book, Tom Doherty Associates, is the winner for teens (ages 13-18). Honor book for teens: “(Don’t) Call Me Crazy: 33 Voices Start the Conversation about Mental Health,” edited by Kelly Jensen and published by Algonquin Young Readers, an imprint of Algonquin Books of Chapel Hill, a division of Workman Publishing. “The Black God’s Drums,” By P. Djèlí Clark, Published by Tor.com, an imprint of Tom Doherty Associates, a division of Macmillan. “The Book of Essie,” By Meghan MacLean Weir, Published by Knopf, an imprint of Random House, a division of Penguin Random House. “Circe,” By Madeline Miller, Published by Little, Brown and Company, a division of Hachette Book Group. “Educated: A Memoir,” By Tara Westover, Published by Random House, a division of Penguin Random House. “The Girl Who Smiled Beads: A Story of War and What Comes After,” By Clemantine Wamariya and Elizabeth Weil, Published by Crown Publishing Group, a division of Penguin Random House. “Green,” By Sam Graham-Felsen, published by Random House, a division of Penguin Random House. “Home After Dark,” by David Small, illustrated by the author, published by Liveright, an imprint of W.W. Norton & Company. “How Long ’Til Black Future Month?” By N. K. Jemisin, Published by Orbit, an imprint of Hachette Book Group. “Lawn Boy,” By Jonathan Evison, Published by Algonquin Books of Chapel Hill, a division of Workman Publishing. “Spinning Silver,” by Naomi Novik, published by Del Rey, a division of Penguin Random House. The 2019 winner is Walter Dean Myers. The 2019 winner is M.T. Anderson. Neil Gaiman will deliver the 2020 May Hill Arbuthnot Honor Lecture. 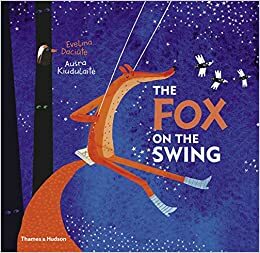 “The Fox on the Swing” is the 2019 Batchelder Award winner. Originally published in Lithuanian as “Laime Yra Lape,” the book was written by Evelina Daciūtė, illustrated by Aušra Kiudulaitė, translated by The Translation Bureau and published by Thames & Hudson, Inc.
“Run for Your Life,” published by Yonder, an imprint of Restless Books, Inc., written by Silvana Gandolfi and translated from the Italian by Lynne Sharon Schwartz; “My Beijing: Four Stories of Everyday Wonder,” published by Graphic Universe, a division of Lerner Publishing Group, Inc., written and illustrated by Nie Jun, originally published in Mandarin and translated from the French by Edward Gauvin; “Edison: The Mystery of the Missing Mouse Treasure,” published by NorthSouth Books, Inc., written and illustrated by Torben Kuhlmann and translated from the German by David Henry Wilson; and “Jerome By Heart,” published by Enchanted Lion Books, written by Thomas Scotto, illustrated by Olivier Tallec and translated from the French by Claudia Zoe Bedrick and Karin Snelson. 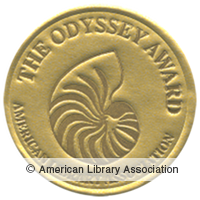 “Sadie,” produced by Macmillan Audio from Wednesday Books, an imprint of St. Martin’s Press, is the 2019 Odyssey Award winner. The book is written by Courtney Summers and narrated by Rebecca Soler, Fred Berman, Dan Bittner, Gabra Zackman, and more. “Du Iz Tak” produced by Weston Woods Studio, a division of Scholastic, written by Carson Ellis and narrated by Eli and Sebastian D’Amico, Burton, Galen and Laura Fott, Sarah Hart, Bella Higginbotham, Evelyn Hipp and Brian Hull; “Esquivel! Space-Age Sound Artist,” produced by Live Oak Media, written by Susan Wood and narrated by Brian Amador; “The Parker Inheritance,” produced by Scholastic Audiobooks, written by Varian Johnson and narrated by Cherise Booth; and “The Poet X,” produced by HarperAudio, an imprint of HarperCollins Publishers and written and narrated by Elizabeth Acevedo. “Dreamers,” illustrated and written by Yuyi Morales, is the Belpré Illustrator Award winner. The book was published by Neal Porter Books, Holiday House Publishing, Inc.
“Islandborn,” illustrated by Leo Espinosa, written by Junot Díaz and published by Dial Books for Young Readers, Penguin Young Readers Group, an imprint of Penguin Random House LLC; and “When Angels Sing: The Story of Rock Legend Carlos Santana,” illustrated by Jose Ramirez, written by Michael Mahin and published by Atheneum Books for Young Readers, an imprint of Simon & Schuster Children’s Publishing Division. 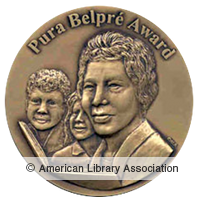 “The Poet X,” written by Elizabeth Acevedo, is the Pura Belpré Author Award winner. The book is published by HarperTeen, an imprint of HarperCollins Publishers. Belpré Author Honor Book: “They Call Me Güero: A Border Kid’s Poems,” written by David Bowles and published by Cinco Puntos Press. “The Girl Who Drew Butterflies: How Maria Merian’s Art Changed Science,” written by Joyce Sidman, is the Sibert Award winner. The book is published by Houghton Mifflin Harcourt. “Camp Panda: Helping Cubs Return to the Wild,” written by Catherine Thimmesh and published by Houghton Mifflin Harcourt; “Spooked! : How a Radio Broadcast and The War of the Worlds Sparked the 1938 Invasion of America,” written by Gail Jarrow and published by Calkins Creek, an imprint of Highlights; “The Unwanted: Stories of the Syrian Refugees,” written and illustrated by Don Brown and published by Houghton Mifflin Harcourt; “We Are Grateful: Otsaliheliga,” written by Traci Sorell, illustrated by Frané Lessac and published by Charlesbridge; and “When Angels Sing: The Story of Rock Legend Carlos Santana,” written Michael Mahin, illustrated by Jose Ramirez and published by Atheneum Books for Young Readers, an imprint of Simon & Schuster Children’s Publishing Division. The inaugural Excellence in Early Learning Digital Media Award is being given in 2019 to a digital media producer that has created distinguished digital media for an early learning audience. The 2019 in Early Learning Digital Media Award winner is Play and Learn Science, produced by PBS Kids. The committee selected two honor recipients including Coral Reef, produced by Tinybop Inc., and Lexi’s World, produced by Pop Pop Pop LLC. “Julián Is a Mermaid,” written by Jessica Love and published by Candlewick Press, and “Hurricane Child,” written by Kheryn Callender and published by Scholastic Press, an imprint of Scholastic Inc., are the 2019 recipients of the Stonewall Book Awards – Mike Morgan & Larry Romans Children’s & Young Adult Literature Award, respectively. Honor Books: “Ivy Aberdeen’s Letter to the World,” written by Ashley Herring Blake and published by Little, Brown and Company, a division of Hachette Book Group, Inc.; and “Picture Us in the Light,” written by Kelly Loy Gilbert and published by Hyperion, an imprint of Disney Book Group. “Fox the Tiger,” written and illustrated by Corey R. Tabor. 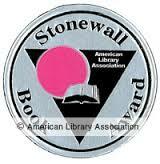 The book is published by Balzer + Bray, an imprint of HarperCollins Publishers. Honor Books: “The Adventures of Otto: See Pip Flap,” written and illustrated by David Milgrim and published by Simon Spotlight, an imprint of Simon & Schuster Children’s Publishing Division; “Fox + Chick: The Party and Other Stories,” written and illustrated by Sergio Ruzzier and published by Chronicle Books LLC; “King & Kayla and the Case of the Lost Tooth,” written by Dori Hillestad Butler, illustrated by Nancy Meyers and published by Peachtree Publishers; and “Tiger vs. Nightmare,” written and illustrated by Emily Tetri and published by First Second, an imprint of Roaring Brook Press, a division of Holtzbrinck Publishing Holdings Limited Partnership. “Darius the Great Is Not Okay,” written by Adib Khorram, is the 2019 Morris Award winner. The book is published by Dial Books, an imprint of Penguin Young Readers, a division of Penguin Random House. 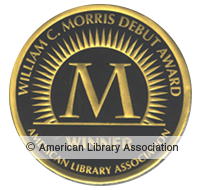 Morris award finalists: “Blood Water Paint,” written by Joy McCullough and published by Dutton Books for Young Readers, an imprint of Penguin Young Readers, a division of Penguin Random House; Check, Please! : #Hockey,” written and illustrated by Ngozi Ukazu and published by First Second, an imprint of Macmillan Children’s Publishing Group; “Children of Blood and Bone,” written by Tomi Adeyemi and published by Henry Holt Books, an imprint of Macmillan Children’s Publishing Group; and “What the Night Sings,” written and illustrated by Vesper Stamper and published by Knopf Books for Young Readers, an imprint of Random House Children’s Books, a division of Penguin Random House. “The Unwanted: Stories of the Syrian Refugees,” written and illustrated by Don Brown, is the 2019 Excellence winner. The book is published by Houghton Mifflin Harcourt. YALSA Nonfiction Award finalists: “The Beloved World of Sonia Sotomayor,” written by Sonia Sotomayor and published by Delacorte Press, an imprint of Random House Children’s Books, a division of Penguin Random House; “Boots on the Ground: America’s War in Vietnam,” written by Elizabeth Partridge and published by Viking Books for Young Readers, an imprint of Penguin Young Readers, a division of Penguin Random House; “The Faithful Spy: Dietrich Bonhoeffer and the Plot to Kill Hitler,” written and illustrated by John Hendrix and published by Amulet Books, an imprint of ABRAMS; and “Hey, Kiddo: How I Lost My Mother, Found My Father, and Dealt with Family Addiction,” written and illustrated by Jarrett J. Krosoczka and published by Graphix, an imprint of Scholastic. 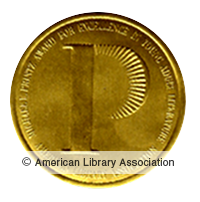 Asian/Pacific American Award for Literature promotes Asian/Pacific American culture and heritage and is awarded based on literary and artistic merit. 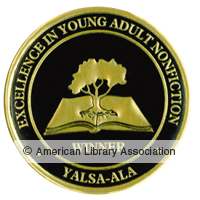 The award offers three youth categories including Picture Book, Children’s Literature and Young Adult Literature. Children’s Literature winner: “Front Desk,” written by Kelly Yang and published by Arthur A. Levine Books, an imprint of Scholastic Inc.
Young Adult Literature winner: “Darius the Great is Not Okay,” written by Adib Khorram and published by Dial Books, an imprint of Penguin Random House LLC. 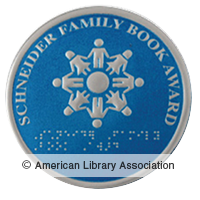 Younger Readers winner is “All-of-a-Kind-Family Hanukkah,” by Emily Jenkins, illustrated by Paul Zelinsky, published by Schwartz & Wade, an imprint of Random House Children’s Books. Older Readers category winner is “Sweep: The Story of a Girl and Her Monster,” by Jonathan Auxier, published by Amulet Books, an imprint of Abrams. Teen Readers “What the Night Sings,” by Vesper Stamper, illustrated by the author, published by Alfred A. Knopf, an imprint of Random House Children’s Books.